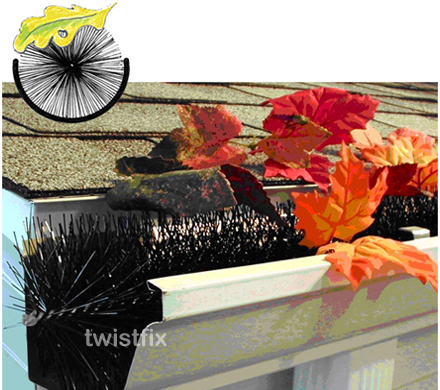 Why wait for autumn and winter to arrive to carry out vital repairs and maintenance to gutters and drains, fit Twistfix gutter guard to gutters and pathway drains preventing blocked gutters which is a major source of damp in buildings if left unattended. Make the winter month’s maintenance and trouble free. Blocked gutters and drains can lead to other problems such as damp; the water has to go somewhere!! Avoid the need to call in costly professionals to unblock gutters and drains, fitting the gutter guard solves gutter and drain problems in minutes, avoiding that yearly ladder climbing. It fits easily around corners and over down pipe outlets. Manufactured from polyp­ro­pylene, brush filaments are spun around a stainless steel wire spine ensuring gutter guard lasts for years. Why should I fit the Gutter guard? Solves the problem of blocked gutters and drains immediately. Is fitted in minutes and last for years. Easy to install, fits around corners and over downpipe outlets. No more calling in costly profes­si­onals. Can be used on pathway drainage such as aco,s,if fits below the grids to stop debris blocking drainage. Prevents blocked gutters which is a major source of damp in buildings if left unattended. The 100mm hedgehog gutter guard is available in 4m lengths and costs only 5.99/m. Now available in single 4m lengths or a trade box of 10 x 4m lengths. For more information then contact us 0845 1236007 or email info@twistfix.co.uk.